Hank Aaron XXIV is a former blernsball player with the Atlanta Braves and was temporarily the worst Blernsball player of all time because he never got a single hit. Ironically, the original Hank Aaron was considered the home run king. He lives in a museum and tried to prevent Leela from being worse than himself because he liked living there. 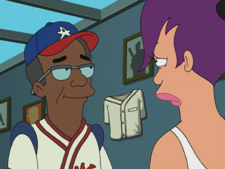 But he was eventually replaced by Leela as the worst Blernsball player of all time because she never got a single out. Fortunately for him, he was still the worst football player. Hank Aaron XXIV: I'm not a holly-gram, but I am crummy. Hank Aaron XXIV: Ah, Wade Boggs! Goes down smooth! Hank Aaron: Well, at least you're still the worst football player of all time! This page was last edited on 16 October 2011, at 10:00.